I know in my last post I said I would discuss the site visit and reception location next, but let’s talk about engagement pictures for just a second. 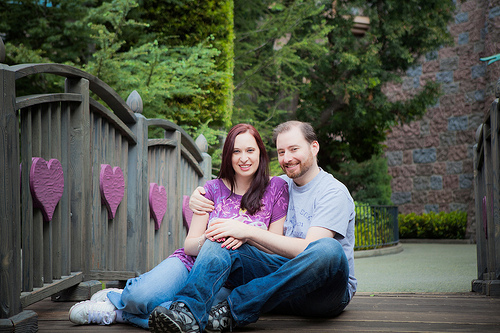 I knew I wanted to take engagement pictures at Disneyland. With Disneyland weddings you have the option of taking pictures in front of the castle before the park opens, but it costs thousands of dollars. Not very economical for someone trying to pinch pennies. At this point I am going to digress from my digression and talk about budget tip #1: NETWORK, NETWORK, NETWORK. Facebook is your friend, or at least it has been for me. I have gotten a ton of wedding-related freebies from my network of friends, the first of which was our engagement photos. Not long after we became engaged, I put out the call on Facebook that I was looking for someone semi-professional to take photos of us around Disneyland, for cheap or free. I got a response from someone I went to high school with, who was trying to get her photography biz off the ground. Not only did she offer us a free session, but her photography is AMAZING. She totally has that vintage vibe that I love, and the things she can do with light! Oh, the light! So one day in April 2011, veeeeeery early in the morning (so early I didn’t have time to do my hair), we met up at Disneyland for some epic engagement pics! This Cast Member Jakob was awesome!!! He played along with us and invited us to go up to the wheelhouse to take more pictures. UH, can you believe we somehow got this shot with no other people in it?!?!??! If you’re looking for any kind of photos, any kind at all, I highly recommend Jessiey Ranck and Pixel Perfect Pixtures! These are all so cute! I’d love to have a set of them. Please!! And congrats on being featured on the Disney Wedding Blog. I can’t comment there, so I’m mentioning it here. So fun! these are such great pics! CongratS! Love the Cheshire one and the one on the riverboat with the cast guy.